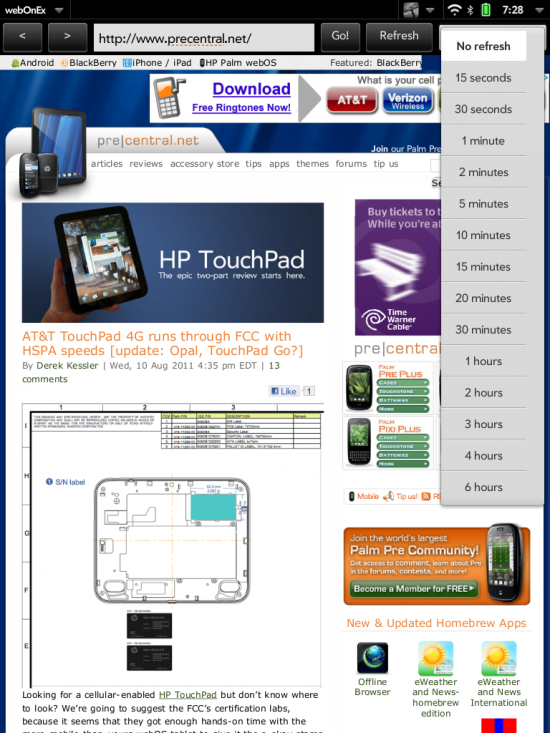 Ever since Exhibition mode was released in webOS 2.1, one of the features that has been missing has been the ability to keep a website loaded up live in exhibition. This can be useful for sports fans who want to keep up with a game or techies who want to follow live blogs from their device. You could use a homebrew app like NoDoze to keep the screen on or keep tapping the screen to prevent it from locking, but this is clearly not all that efficient. However, all TouchPad owners now have access to a free app called webOnEx, by Mohit Sindhwani, that will provide you with a fully interactive web browser in Exhibition mode. 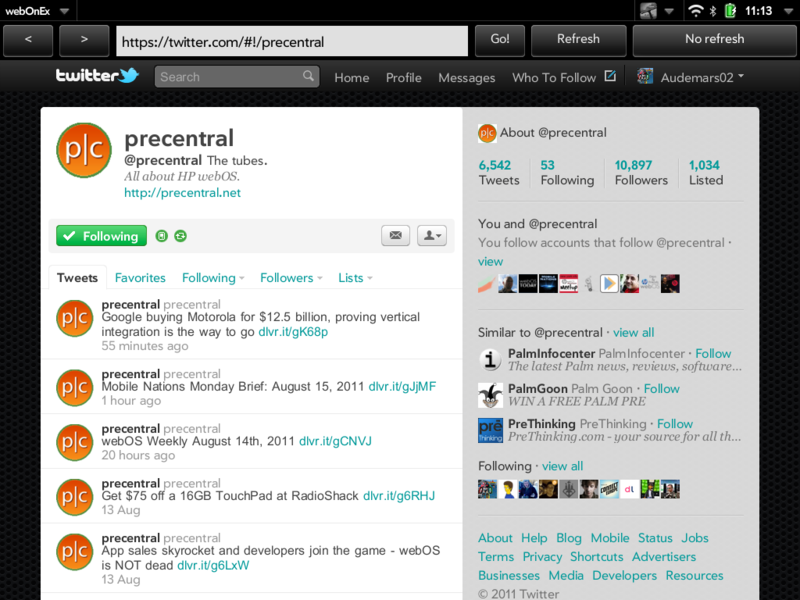 The web browser interface is pretty bare bones with just a navigation bar across the top of the screen. 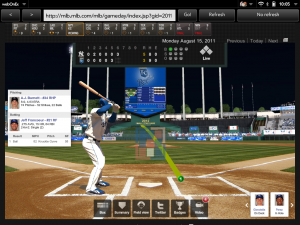 You have your typical web browser's back and forward buttons, a URL input box to enter a website address and a "Go!" button to navigate to the entered website (the "Enter" key on the keyboard will also work). Next is a "Refresh" button to manually refresh the website, as well as a refresh interval selector to have the app automatically refresh the site from every 15 seconds up to every 6 hours, or you can choose a "No refresh" option to only manually refresh the site. 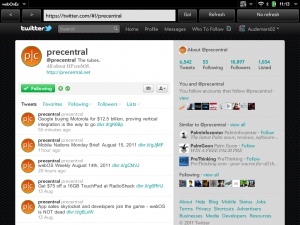 As sparse as the interface is, the available functionally is even more so. There no way to bookmark sites, you can not set a homepage, and the formatting of most sites look a bit off with text that is bigger than it should be. 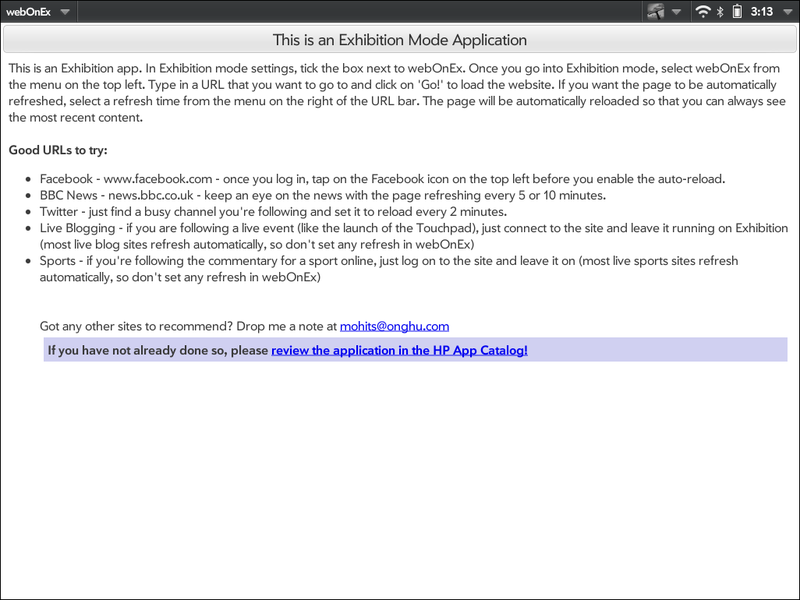 However, none of that really matters because you now have a free app that will give you a fully interactive web browser in exhibition mode! 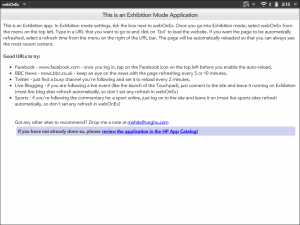 You can even load up twitter.com and follow along with your tweets while in exhibition without the need of a dedicated twitter client. And despite that fact that the app description in the App Catalog says that Flash will not work, I have had no problems running Flash content in the app. 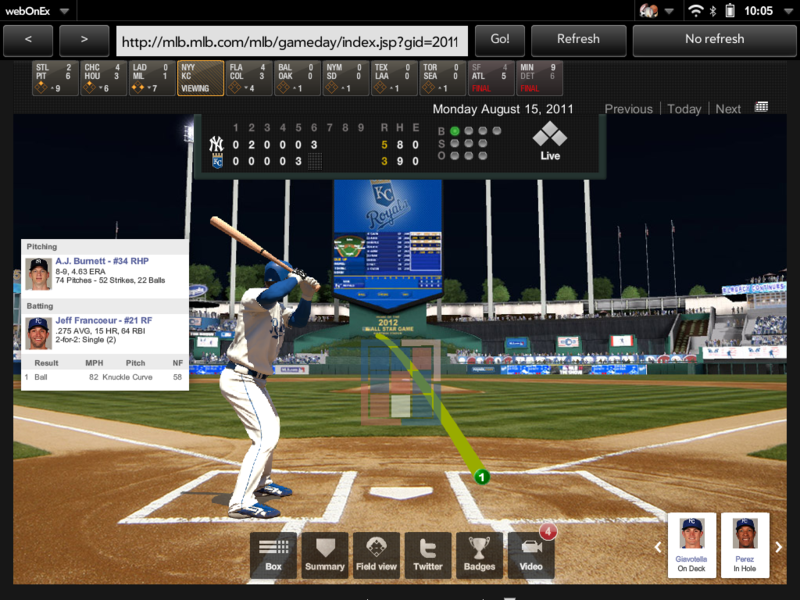 For example, this has been a great way to follow baseball games with MLB.com's Flash-based Gameday. Despite it clear lack of any advanced features, webOnEx is still an app that I extremely happy with. While you can not bookmark sites, it will launch to the last site you visited, providing you with an easy way to continue you browsing experience even if you get interrupted and have to exit exhibition mode. There are a few issues with the app not loading up the full page correctly or becoming non-responsive, but these are detailed in the app description and will hopefully be fixed in a future update. While I hoped that an exhibition web browser would have been built into the stock webOS functionality, at least we have third party apps that can fill in these gaps. Now we just need this app for webOS 2.0!